In the Amy Brown Collection from Anonymous Mint, those numismatists buying silver online will find a total of six designs available from famed fairy artist Amy Brown. With a career that spans 26 years and features more than 2,000 individual watercolor artworks of fairies, Brown’s career has been stellar. 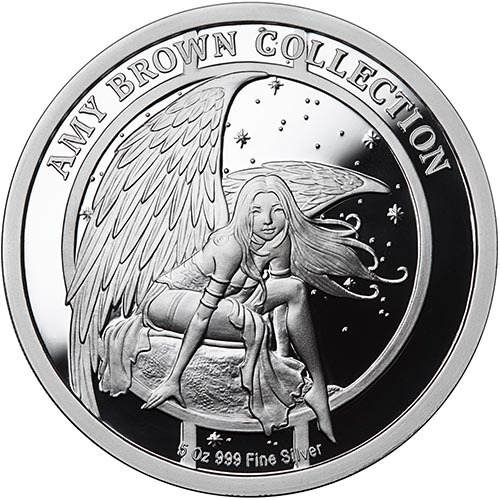 Today, 5 oz Proof Silver Amy Brown Collection Discovery Fairy Rounds are available to you online at Silver.com. Ships to you in a protective plastic capsule with included Certificate of Authenticity! Fourth design in the fairy series of Amy Brown works by Anonymous Mint! The fairy known as Discovery features on the obverse. Dusk, the fairy of twilight, is found on the reverse. Series designed by Julie Lindquist. Amy Brown’s career launched in 1992 when she was working in a small art gallery. With an empty frame on the wall, the gallery manager asked Brown to fill it with some of her own fairy artwork. After the piece sold quickly, more of Brown’s fairy artwork began to fill the walls. From there she began selling her artwork at local galleries and street fairs before taking it to the internet in 1997. All silver rounds in the Amy Brown Collection are sold inside of protective plastic capsules for ideal, easy storage and protection of the round’s condition. The rounds in this series all feature a numbered Certificate of Authenticity that matches the serial number found on the rim of the rounds offered by Anonymous Mint. 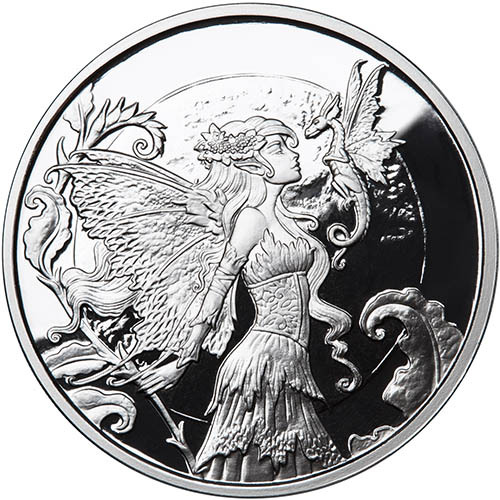 The obverse of the 5 oz Proof Silver Amy Brown Collection Discovery Fairy Round includes the design of the fairy known as Discovery. She is found in right-profile relief in the design, with her delicate wings mimicking the shape and style of the fern leaves that grow around her, framing her body on the round. On the reverse of the 5 oz Proof Silver Discovery Fairy Round is a common design used in the entire collection. The fairy here is Dusk, created in 2003 by Brown and featured in a collection of her works known as The Art of Amy Brown II. Dusk is the fairy watching over twilight in the fairy realm, with twinkling stars overhead as she watches out over the realm. Anonymous Mint is a small, private American mint. The primary role of Anonymous Mint is the creation of silver and copper rounds with beautiful designs and low mintage figures. Please don’t hesitate to reach out to Silver.com with questions. You can contact our customer service team at 888-989-7223, chat with us live online, or send us an email with your inquiries. Don’t forget to check the latest price of silver per ounce on our website when shopping!